Win a brand new 65” 4K LED Samsung TV & Soundbar just for watching a Football Game! Congratulations to Michelle James of Midland she had the winning square and has won a brand new 65″ Samsung 4K LED Television and Soundbar courtesy of Simcoe Audio Video… Barrie’s premier Audio Video Destination! 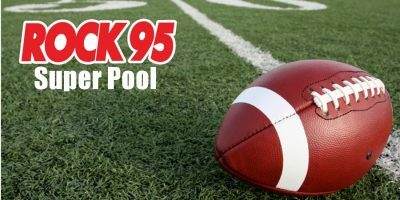 Listen to Rock 95 for your chance to win a square on Rock 95’s Super Pool Grid. The winner is determined by looking at the last number in each teams’ score, and then matching those numbers on the grid and seeing which square intersects those two numbers. An example would be if the Miami Dolphins were playing the New York Giants in the Super Bowl, and the final score was Miami Dolphins 23, and NY Giants 14. The last number for the Dolphins is 3, and the last number for the Giants is 4. The square on the grid that has the Dolphins with a number of 3, and Giants score of 4, would be the winner.